The radiant Amethyst Boho Dress in amber with its gathered detail and elastic cuff to gently billow the sleeve has an unmistakable vintage vibe with a twist of modern cool. This ever-popular boho dress design is reimagined to perfection in this vivid floral print, with two tiers featuring frill detail and rouleau necktie finished with antique brass beads. The thoughtfully designed print with contrasting geo boarder placement on the front and back yolk makes this hypnotic piece much more than a pretty floral dress. Wear it paired with a chunky knit for those cooler wine bar nights or keep it casual with a tan slide and brimmed hat for a mid-week meander at the local market. Crafted using LENZING™ ECOVERO™ a consciously created fibre, this floaty viscose dress has been sustainably sourced from only certified and controlled wood sources. LENZING™ ECOVERO™ is produced with a significantly lower environmental impact and we are proud to incorporate this visionary fabric for the first time into our Lady Amethyst collection as part of our commitment to walk a little lighter on the earth. The ravishing Amethyst Robe with its kimono inspired sleeve and detachable tie belt is glorious in this art nouveau inspired, romantic floral print. Float, glide or swish your way around in this unlined piece, perfectly framed with intriguing geometric borders on the sleeves. This gorgeous floaty piece has been crafted with LENZING™ ECOVERO™ a consciously created fibre. The viscose has been sustainably sourced from only certified and controlled wood sources. LENZING™ ECOVERO™ is produced with a significantly lower environmental impact and is part of our commitment to walk a little lighter on the earth. Wear this opulent piece over our ethereal Maggie Mini Dress for a relaxed and feminine look, perfect for a casual coffee catch up or pack it for your resort side holiday and wear over our Amethyst intimates for an enchanting banana lounge throw-over. This signature Spell piece is an easy-wear addition to almost any outfit, fall in love with this elegant floral beauty, a modern take on this classical style. The effortlessly elegant Clementine Soiree Dress with its full elastic drawstring waist, finished with antique brass beads and tassels is a radiant glamour in a barely blush tone woven with a hint of shimmering gold lurex for a touch ethereal charm. Featuring an elastic cuff and shirring detail on the sleeve, this beautifully relaxed silhouette, crafted in fine rayon, floats with ease with three cascading tiers from the waist and is gently billowed by both front and back yolk panelling detail. Mesmerise a crowd in the unassuming beauty, perfect for a twilight soiree paired with a slim heel or swap your heel for a tan slide for a dazzling garden picnic. Simplicity meets intrigue in this fully lined and romantic design, perfectly finished with a braided necktie and antique brass beads. This heavenly Lily Maxi Kimono in Lilac with its billowing kimono sleeve and perfect patch pockets is a classic Spell design and sure to adorn any morning with its breathtakingly beautiful sense of understated elegance. Glide with grace as the soft lilac tones and custom printed bouquet of pretty florals tumble from the soft rayon jacquard, floating behind you as you walk. This ultra feminine kimono paired with our matching lily intimates is a glamorous way to read the paper on a Sunday morning at home or throw on with same faded denim and slides for a casual mooch around the markets. Linger awhile in this delicately romantic piece, finely crafted to beautify any occasion. The captivating Maisie Bambi Gown with its floating high-low hem and adjustable tie front with keyhole sides, is a daringly sensual, yet sophisticated design packed with fascinating detail. Lined at the bust for easy-wear and featuring a delicate flounce sleeve with frilled hem, this graceful piece is luminous in the signature Maisie print. Inspired by an original country town wallpaper this elegant floral has been reimagined with a bit of Spell magic, including soft contrasting borders to offer a grown-up floral print that moves gracefully in this fine floaty rayon. Wear this extraordinary dress with a statement boot to make the most of the old world feel or pair with a slim heel for your balmy island soirée. A silent show-stopper this dreamy dress is unforgettable and bound to be a collection favourite. The captivating Maisie Robe with its dreamy colour palette and soft, romantic drape is a classic Spell style that will have you gliding with grace. Adorn yourself in this heavenly piece paired with the Maisie intimates for your pool-side resort island holiday and radiate a vision of turquoise brilliance or wear over worn denim and a rocker tee to add a touch of feminine romance to your grungy morning coffee run. This signature Maisie print, inspired by an original country town wallpaper, stunningly reimagined through the Spell lens into this hypnotic floral, that floats effortlessly from the soft rayon with boarder placement on the collar and classic kimono inspired sleeve gives this unlined piece a stylish and unique look. A piece to keep, this robe adds a touch of elusive opulence to any occasion. The glorious Maisie Skirt with its impressive high-low hem finished with gathered frill is a graceful and feminine beauty, glowing with a hint of vintage floral charm. Crafted in textured rayon jacquard for captivating movement, this divine piece features some favourite Spell touches and is certainly one for the collectors. Made with comfort in mind this unlined skirt has a full elastic waist and is the perfect ensemble feature. Pair it with a knotted tee for a low-key ladies lunch. Swish the day away in this sensual and radiant design, complete with border panel throughout the hem and an easy sense of confident contentedness. The mesmerising Maisie Strappy Dress with its cute side pockets and intriguing border panel on both the bust and hem (finished with delicate frills), is a piece of effortless charm. The signature Maisie print, inspired by an original country town wallpaper is both sophisticated and whimsical, completely radiant framed by contrasting borders and floating effortlessly in its fine rayon, statement silhouette. A dress for almost any occasion, add an ankle boot and brimmed hat and make the most of the old-world vintage charm with a twist of modern cool or pair with a simple tan slide and some floral flair to your Monday morning meeting. An unassuming beauty, with a down-to-earth feel, the Maisie Strappy Dress features adjustable straps, is lined at the bust and is an easy-wear, floaty dream dress with plenty of eye-catching detail. This opulent Oasis Maxi Kimono in opal with its statement kimono sleeve and charming patch pockets is a twist on a classic Spell design that will adorn any occasion with a touch of glamour, romance and mystery. The bewitching signature Oasis print, inspired by an eighteenth century vintage Indian linen, is at its radiant best in our luminous Opal colour way. Pretty pastel tones are welcomingly interrupted by flashes of peacock blue in a festival of colour that is understated yet pleasantly haunting. Wear with your favourite worn-in denim and rocker tee for a grungier "need coffee now" feel. Featuring a detachable tie belt and crafted in fine rayon woven with gently shimmering lurex, stay awhile in this elegant, unlined and luminous design. 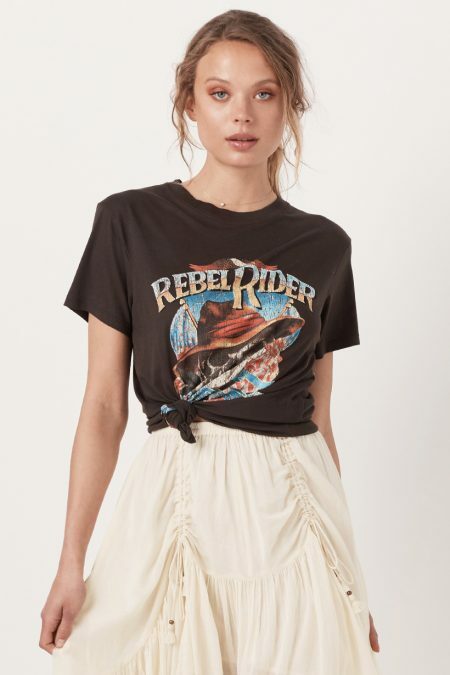 The feisty Rebel Rider Organic Tee in a soft wash charcoal with its rock n roll hand-drawn print is for the wild and wild-at-heart. This easy-wear piece adds a bit of "I just threw this on" to almost any ensemble and will be a guaranteed collection favourite. Featuring a ribbed neck, a boyfriend fit and crafted in our favourite light organic pima cotton, this chic and carefree tee oozes cool-girl vibes and is designed to be well worn. Pair it with the Seashell Organic Rouched Skirt to add a femme rock vibe to your market day meander or wear it knotted with your favourite printed maxi for the perfect beach to bar ensemble. Forget the rules and dance with danger in this coveted style, perfect for fashion outlaws. The feisty Rebel Rider Organic Tank in a soft wash charcoal with its rock n roll hand-drawn print is for the wild and wild-at-heart. This easy-wear piece adds a bit of "I just threw this on" to almost any ensemble and will be a guaranteed collection favourite. Featuring ribbed neck and arm holes and crafted in the favourite organic pima cotton, this untamed tank oozes cool-girl vibes and is designed to be well worn. Pair it with any skirt to add a femme rock vibe to your market day meander or wear it knotted with your favourite printed maxi for the perfect beach to bar ensemble. Forget the rules and dance with danger in this coveted style, perfect for fashion outlaws. The ethereal Seashell Organic Ruched Skirt with its unique high-low frilled hem, creates a soft and free-spirited look with a hint of gentle romance and an easy wear ability. This down to earth beauty crafted in butter-soft organic cotton is lightweight and expertly shaped with drawstring detailing on the front and finished with ties and beads for a touch of thoughtful elegance. 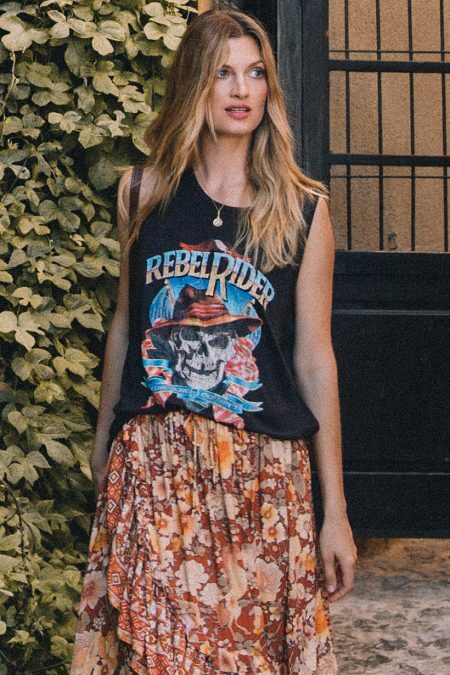 Channel some shipwrecked island vibes and pair this glorious skirt with a colorful shirt for a breezy resort-side weekender or add a grungier feel with a threadbare rocker tee and slides for your mid-morning cafe catch-up. Fully lined and featuring a full elastic waistband this breezy and enigmatic piece is packed with detail and certainly one to hold on to. The dazzling Willow Robe in meadow with its classic kimono inspired sleeve and detachable tie belt, is an expressive piece with a sense of old world glamour. Crafted in soft rayon jacquard, the dreamy blue and rich turquoise tones dance from the muted yellow background, offering a chic and elegant, vintage feel. Featuring side splits and intricate border placement on the sleeve, this is an instant Spell classic and is flawlessly designed for mesmerising movement. Wear with the breathtaking Willow Mini Dress for a splendid vision of floral opulence and an unforgettable dinner party ensemble or simply add this glowing beauty to almost any outfit for an instant infusion of enigmatic presence. Perfect with worn denim and rocker tee for your morning coffee run or drape yourself in this stunning piece for your weekend morning rituals. Perfect as a gift for a bride to be, this unlined robe is simply glorious and certainly one for the collectors. This radiant Willow Tasseled Mini Dress with its unforgettable tassel detailing on the sleeves and hem and glorious placement printed colour combination is drop dead gorgeous and sure to be a collection favourite. Featuring a bouquet of soft blooms popping in vivid colour from the flowing rayon fujet, this unlined dress is quiet the show-stopper. Expertly shaped with a detachable tie belt, a long line keyhole back with elastic loop and kimono inspired sleeves. Designed for mesmerising movement, this seductive mini dress is truly captivating and will surely light up any room. A simply stunning, easy-fit maxi jacket slash cardigan that promises to be the perfectly elegant transeasonal outerwear piece this season. This white River Poncho in Alabaster is made with 100% cotton and is oh-so-soft. A Mid length sleeveless jacket that features large pockets, a tassle trim neckline and hem. This style will pair with literally everything; jeans, dresses, skirts and tights- you can do no wrong. You wont want to take it off on those chilly winter days.